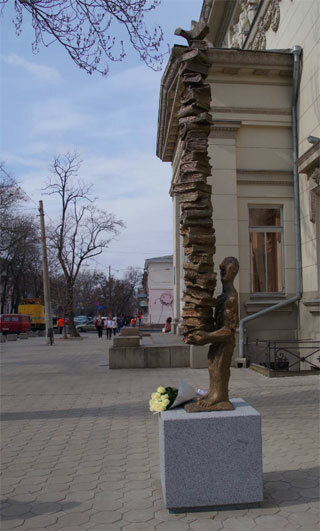 On 26th of March 2019 in front of Odessa National Scientific Library was installed Reader Statue with inscription More Books, Less Fear and stack of books going to infinity. The author of the statue is famous Odessa sculptor Mikhail Reva. With height of 4.5 meters Reader Statue going to attract attention of every passerby who walk by Pastera street in Odessa. Number of books in the stack is 37 and the last one is open with inscription of Latin word "Infinitum". Even the statue is installed a bit far from the historical city center of Odessa we recommend to walk just 1 km or 15 minutes one way from Odessa City Garden to enjoy colorfull emotions and make selfi with unique statue. Reader Statue feels like come from the past as modern variant looks like digital notebook or smart phone - small and all your books in one place. Some people still love to touch books and return to them in their life to get knowledges. Hope that the new statue will become important sight and attraction of Odessa.